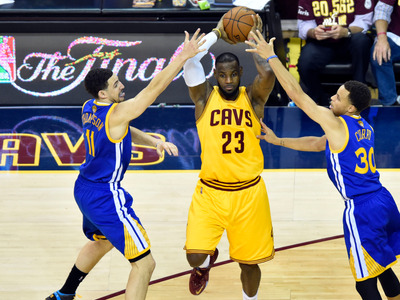 Ken Blaze-USA TODAY SportsLeBron James being guarded by Stephen Curry and Klay Thompson in the NBA Finals. The NBA will display YouTube TV’s logo on the courts during the Finals, and YouTube will also get commercial spots on ABC during the games. The NBA also has plans to make more of its content available on YouTube TV, including, eventually, League Pass. YouTube TV is acquiring more and more sports content, including streaming rights to select soccer matches. The NBA has agreed to a major advertising deal with YouTube TV that will make the latter the first-ever presenting sponsor of the NBA Finals, the league revealed in a press release on Monday. Under the terms of this deal, the NBA Finals will be officially referred to as “The Finals presented by YouTube TV,” and the official logo for the event will be featured prominently during the games, even on the court. One Twitter user has already taken the effort to project what that may look like (you can see the logo near center court). You can see more versions of the new Finals logo at Uni Watch. In addition to having their brand name displayed on the court, “YouTube TV will be featured in ABC commercial spots and in-game call outs, along with having a major presence across the NBA’s digital and social media assets,” the release states. YouTube TV will also become the presenting sponsor of the finals of the WNBA and the NBA G League. This is one of a few moves the NBA has made to further its relationship with YouTube TV, as the league will also be adding NBA TV to YouTube TV’s base package, and has plans to allow league pass to be streamed on the YouTube TV platform for an additional fee. YouTube TV, meanwhile, is clearly interested in the sports-content game, as noted by Variety. The platform is also set to be the presenting sponsor of the 2018 and 2019 World Series, and it also has streaming deals with Los Angeles FC and the Seattle Sounders of MLS.